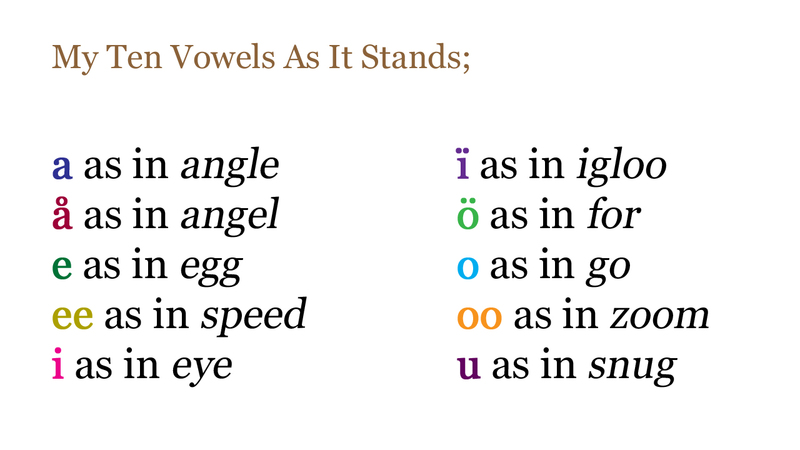 What follows are the seven sacred vowels (plus the two extra sounds we found in other variations of the seven), then the ten vowel sounds I'd identified. The bracketed numbers next to each show the correspondences between the two. The one sound without a correspondence is the [i] sound, as in igloo. Much as I would like to reduce the number of vowels down to a core seven for aesthetic taste I still think it would be much better to keep the ten. Each one sounds quite distinct and the language would suffer for the loss of any. Going forward the question now is what symbols I use to represent each sound. The Greek letters [H] and [Y] are already in use as consonants so they're off the table. I'm tempted to use the omega symbol [Ω] to represent the "aw" sound. I'm also tempted to keep the double O [oo] and double E [ee] usage just for the sheer practicality - though it would undermine the technical purity somewhat. If I used these symbols it would leave me with just two vowels without symbols. There's also the problem of choosing symbols that are available on a standard keyboard - which [Ω] isn't of course. There's also the problem that the lower case [Ω] symbol is just like the symbol for the letter [W]. I could borrow symbols from another language. Or perhaps use some type of diacritic - the little accents and symbols that appear above a letter to signify a different pronunciation - à, ë, etc. I've just had a look and a line that goes over the top of a letter is called a macron - an [a] with a macron looks like this; ā. There's also a little symbol called an overring that can appear above a letter, though it doesn't look as much like a halo as I'd hoped - å. I'll go with it for the time being though. Come to think of it the [i] symbol has a little dot above it already in its lowercase form, so maybe I would be better off keeping that symbol for the "eye" sound and then using another variation for the igloo [i]. I think I'll go for an [i] with two little dots above it - ï. Perhaps not ideal, but at least it gives us a way to distinguish the two for the time being. I think I'll use an [o] with two dots above it to symbolise the "aw" sound too - ö - instead of the omega symbol [Ω]. Finally, having looked at the various other symbols and accents used in other languages I quite like the idea of using symbols that join two letters together for the double [E] and double [O] sounds. These are called ligatures, the most common example probably being the conjoining of the vowels [A] and [E] - Æ (æ in lowercase). I managed to find two [O] symbols conjoined [ꝏ] but not the [E] symbols. 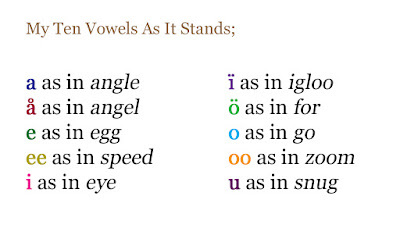 (1) - [a] as in angle "a"
(2) - [e] as in egg "e"
(3) - [å] as in angel "ay"
(4) - [ee] as in speed "ee"
(5) - [i] as in my "eye"
(6) - [ö] as in oxen "o" or law "aw"
(7) - [o] as in go "oh"
(8) - [ꝏ] as in zoom "oo"
(9) - [u] as in snug "u"
(10) - [ï] as in igloo "i"
The Seven Sacred Vowels Continued..